The reason I like doing this is not for the big huge mess that my room ends up in, with itty bitty pieces of scraps everywhere, believe it or not; but because the students really learn how to build and piece things together. 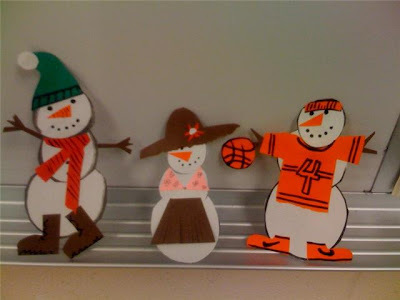 They also get to put their creative hand on them and make any type of snowman character they want. I think I may be done posting Christmas projects now...we'll see, we'll see.